Saving Jules: What HAS he done now? Nigel’s brother has spent the last week with us, and we decided to have a family day last Saturday for my birthday. It was lovely. Wayne took my parents in his 4WD ute, we had the kids in ours and we took the drive to Lost World Valley (part of Lamington National Park). We picked wild raspberries, got a bit edgy when a bull came very close to us protecting his ‘Wifey’ and the kids had fun skipping stones in the creek. From there, we took Duck Creek Road (4WD only) up to O’Reillys (Lamington National Park) for coffee, juice and hot chips before stopping off at one of our favourite lookouts – Kamarun lookout – to take in the gorgeous view before the long drive home. Between the two of us, we managed to convince him to let us roll him over onto his back so Nigel could check his arm while I supported him from behind. Mum came over with her every present, fully stocked first aid kit and while I cleaned the scrapes on one arm, Nigel was checking over the other one, which Julian was having trouble moving, and all the while we were trying to find out what had happened. Turns out he had tried to vault a stone pillar using his right hand, which had slipped and he put his left arm out to ‘save’ himself as he fell. We had 2 junior Doctors come over (they were having a bit of a break away and had decided to wander up and check out the sunset) who are currently interning at Redcliffe hospital (what are the odds?!) and offered to check Julian over to make sure nothing was broken. Luckily for Julian, one of them was interning in Orthopedics!!! There was no break, however they did say to keep an eye on his arm because some injuries wouldn’t really show up until the next day. And the next morning, this proved to be true. His elbow had swollen up overnight, his wrist was extremely painful and he had pins and needles in his fingers. So, off to the hospital we went. The result? 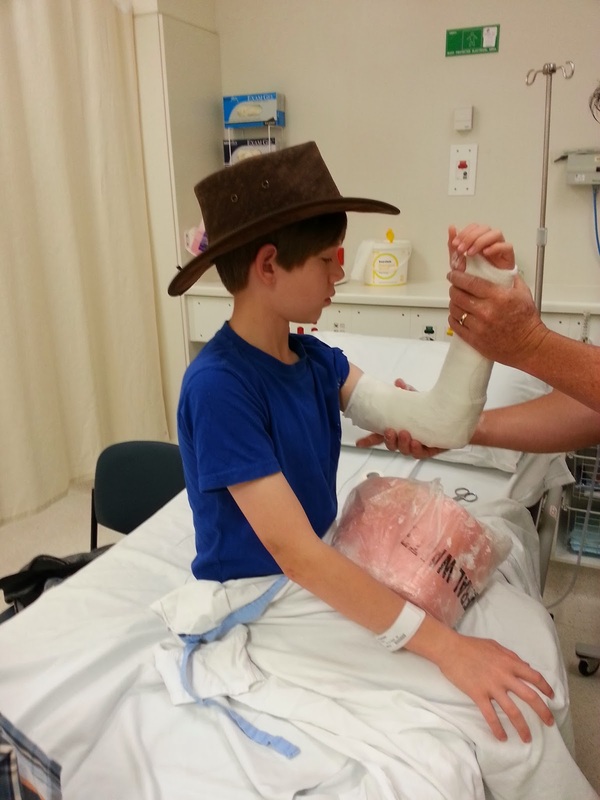 Julian had fractured the radial head in his elbow and had also severely sprained his wrist. So, we have an appointment on Monday to see if they’ll keep the cast on or keep it off. In the meantime, he’s in a lot of pain, but very thankful he hadn’t broken anything. Nigel and I would like to send out a huge thank you to the 2 Junior Doctors from Redcliffe Hospital who helped us out on Saturday afternoon. You were both very confident, reassuring and comforting. I may not look forward to meeting you again in the future, but don't take that personally!!! 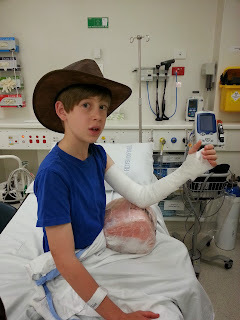 Also, a huge thank you to the staff at Robina Hospital Emergency Department. I don't think I have ever seen a more efficient Emergency Department (and I have seen a LOT). No doubt I will be seeing you again sometime in the future!